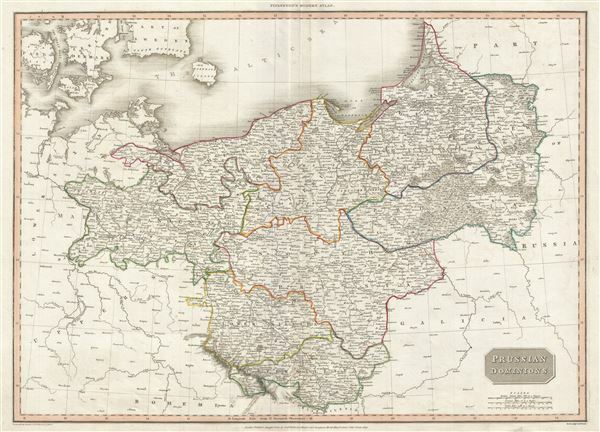 A scarce, beautiful, and exceptionally interesting example of John Pinkerton's stunning 1810 map of Prussia. The Map covers from the Baltic Sea to Upper Silesia and from Lower Saxony to Russia, including parts of modern day Poland. Prussia at this time was emerging from the Napoleonic wars as the dominant Germanic Power and would remain so well into the 20th century. The map was drawn by L. Herbert and engraved by Samuel Neele under the direction of John Pinkerton. It was published in the 1813 edition of Pinkerton's Modern Atlas. It is noteworthy that the color work reflects publication for European audiences. Other issues with a more full color approach were intended for sale to other markets. Very good. Minor wear along original centerfold. Blank on verso.